Intelligence: Searching the environment for conditions calling for a decision. 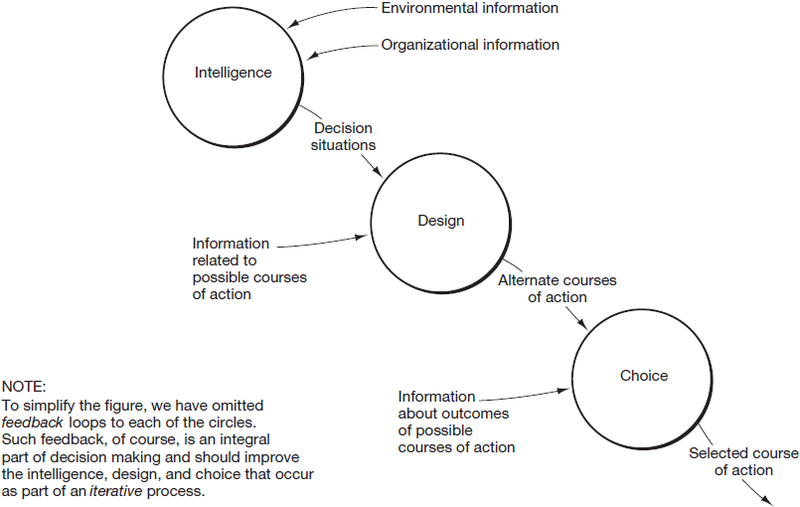 Design: Inventing, developing, and analyzing possible courses of action. What are the three steps in decision making? Figure 5.1 depicts these three steps. Analyze the figure to see what information is required for each step. Information from and about the environment and the organization is needed to recognize situations or problems requiring decisions. For example, information about economic trends, marketing intelligence, and likely competitor actions help management recognize opportunities for new markets and products. Information about inefficient or overworked processes in the organization focus management’s attention on problems in the organization. Managers use information from within and from outside the organization to design courses of action. For example, information about human resources, production capacity, and available distribution channels help management to develop alternative methods for producing and distributing a new product. Finally, a manager requires information about possible outcomes from alternative courses of action. For example, to choose from among alternative production options, a manager needs information about the costs and benefits of the alternatives and about the probability of success of each option. Once a course of action is in place, the decision needs to be implemented and the results communicated. Many people find that the most important step in the decision making process is how well it is implemented. Effective communication is a key component of this success. Technology Insight 5.1 describes the effective presentation of information in technical communications.